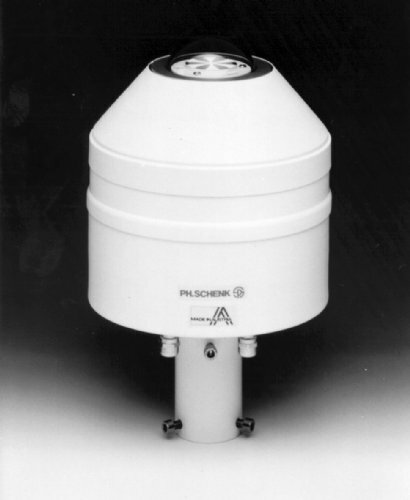 The 240-8101 Star Pyranometer is a basic instrument for measuring direct and diffuse solar radiation (global radiation). The sensing element is composed of 12 wedge-shaped, thin copper sectors arranged radially, 6 white alternating with 6 black. The 240-8101 Star Pyranometer (ISO First Class) is a basic instrument for measuring direct and diffuse solar radiation (global radiation). The sensing element is composed of 12 wedge-shaped, thin copper sectors arranged radially, 6 white alternating with 6 black. Six chromel-constantan thermocouples are embedded in each sector to produce a 72 junction thermopile. Output from the thermopile is approximately 15µV/Wm². The white sectors of the sensing element are painted with a Kodak paint that yields an almost perfect reflective surface. The black sectors are painted a highly absorbent flat black. When the sensor is exposed to solar radiation, a temperature difference is created between the black and white sectors. This temperature difference is proportional to the radiation intensity and is not affected by ambient temperature. 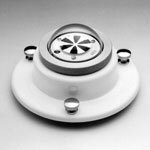 The windshield protecting the sensor is a 2.75" diameter, polished crystal glass dome which admits electromagnetic radiation between 0.3 and 3 microns. The highly reflective outer surface, along with the mass of the case, keeps the case interior at ambient temperature. Instrument leveling is accomplished by means of a bull's-eye level and three leveling feet. When used in conjunction with an optional shadow band, the star pyranometer will measure diffuse solar radiation. Direct radiation can be measured using two star pyranometers: one, with a shadow band, to measure diffuse radiation and a second, without the shadow band, to measure both direct and diffuse. The difference between the two measurements is direct radiation. The 240-8106 Protective Housing uses a ventilator to blow air from the bottom to the top of the star pyranometer, keeping the glass dome free of condensation, dew, and rain. In addition, there is an electric heater that turns on at approximately +10°C (+50°F) which assists in keeping the glass dome clear when it snows. This unit will help keep maintenance to a low level. The glass dome must be kept clean at all times to provide accurate readings. The unit requires 24 Vac at 80 Va for proper operation.